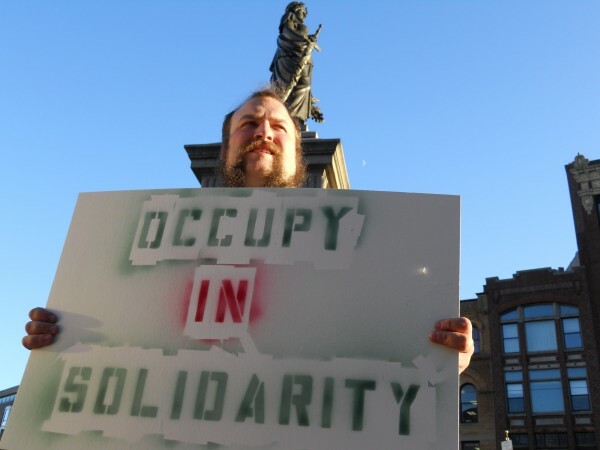 John Schreiber holds a sign supporting OccupyMaine on Thursday afternoon in Monument Square. PORTLAND, Maine — All three members of the Public Safety Committee opposed a permit proposal by OccupyMaine that would allow the group to stay in Lincoln Park for six months and recommended against changing any city ordinances involving the use of public parks. After a five-hour meeting that included presentations by city staff members and an extended public discussion period that featured views from both sides of the issue, the committee said the drain on city resources would be too great and doubted the ability of OccupyMaine to control the rising number of violent incidents it has seen. The committee’s recommendation will be forwarded to the larger City Council for consideration at a special meeting on Wednesday. A captain for the Portland Fire Department and the Portland inspection director both said they’d encountered “serious life safety issues” at the park but said the issues were correctable. Acting Police Chief Michael Sauschuck said the number of calls for service in the Lincoln Park area have roughly doubled from the average amount from the two previous years, although some members of the public commented that this was only a result of the density of occupants to that area compared to years past. Sauschuck said so far there have been 16 arrests and three summonses in the last two months at Lincoln Park. Some supporters of OccupyMaine applauded the encampment for highlighting the problem of homelessness and serving the homeless population in Portland. Other community members, including some from Portland businesses, spoke out against the camp as an “eyesore” and a detriment to the economy. Doug Fuss, president of the Portland Downtown District and owner of Bull Feeney’s, said he is concerned what precedent allowing the encampment would set. “I think it’s a disruption. It’s a drain on city resources that the rest of use are counting on,” he said. Committee member John Coyne made it quite clear that he disagreed with the entire permit, objecting to each section individually. “This is an occupation. This is a group of people who have taken over,” Coyne said. Committee member David Marshall disagreed with the permit as it was written but was more understanding. “If it was changed to address the public health welfare and safety concerns that we’re seeing in our community then I could get closer to it,” he said. Marshall voiced support for a 24-hour free speech zone but said he questioned whether overnight camping was necessary. Since first assembling in Lincoln Park on Oct. 3, the number of occupants has grown to cover most of the park. Most of the structures are personal tents, although the encampment also has a public library, kitchen, spiritual tent and medical tent. The OccupyMaine’s petition seeks to establish a permanent 24-hour free speech zone in a portion of Lincoln Park that could be used by any group to exercise its First Amendment rights. It also asks to continue OccupyMaine’s established community encampment for a period of no more than six months. In response to city’s safety concerned, the permit attempted to outline changes that would rectify these issues by requiring tents to be at least 10 feet apart, limiting the number of occupants, ensuring all structures meet fire safety codes and applying for a temporary food service license. The petition also requested permission to install a communal warming tent that would contain a wood or pellet stove. Heather Curtis, 42, who was the OccupyMaine member who signed the petition, commended the city for keeping communication with the group open, but had a warning if the city tries to clear the park.